I do read cookbooks for the stories and to daydream about when and why I might make the recipes some day in the future. But, I also do a lot of cooking from cookbooks. With the new book from Elisabeth Prueitt, her hope is that it will be used for both and more of the latter. It’s Tartine All Day: Modern Recipes for the Home Cook , and I received a review copy. Right away, this book felt like a familiar friend I’d be spending time with in the kitchen. The style of cooking is very workable into regular life. Prueitt’s previous book presented pastry recipes from famed Tartine and her husband Chad Robertson’s books are devoted to the breads from the bakery and cafe, but this one is just for cooking at home. Although Prueitt has spent years creating amazing pastries for Tartine, she happens to be gluten-intolerant. So, all of the baking recipes in this book are gluten-free. She is able to eat the naturally-fermented breads her husband makes due to the type of wheat and slow fermentation process used, so some recipes do incorporate that style of bread. I should also point out a formatting note. The recipes have been presented like those in Mastering the Art of French Cooking. Rather than having a full ingredient list followed by the method, the ingredients are grouped to the left of the instructions in which they’re used keeping all the information well organized and easy to navigate. Right off the bat, there’s a chapter for Basics that will elevate all sorts of meals. It includes sauces and dressings like Tzatziki and Tomatillo Salsa and quick pickles and jams. From there, the chapters move through breakfast, snacks, soups, salads, main courses, gatherings, and desserts. I love the thought of the simple Goat Cheese-Garlic Spread to scoop onto bread, crackers, or sturdy vegetable slices. And, the Granola Bark, like a super-thin granola bar, is something I need to try soon. The soups range from hearty to light, and our heat and humidity has me gravitating to the chilled Summer Greens Soup made with avocado, bell pepper, herbs, and jalapeno. I made a variation of the Seafood Salad with Lemon-Garlic-Herb Dressing that was delicious, and I have pages marked for the Lemon Pound Cake made with fruit on the bottom and the crumble-topped Jam Bars. 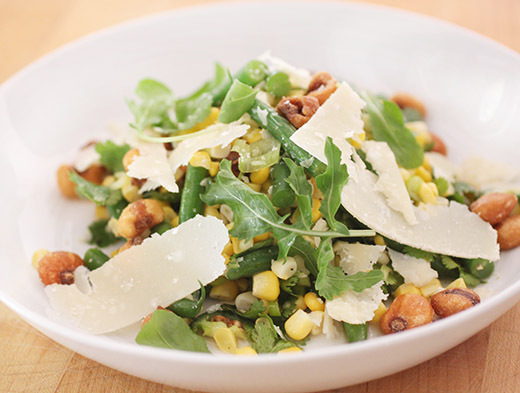 First up, though, I want to tell you all about the Corn, Green Beans, and Parmesan salad. 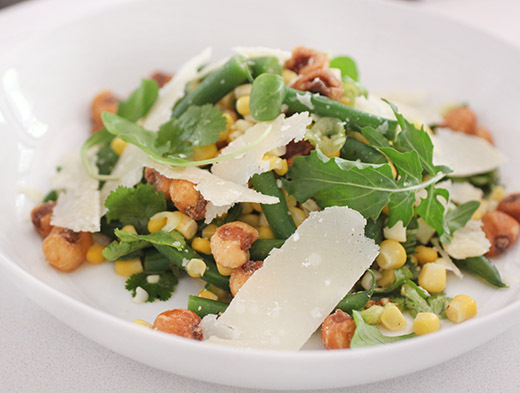 This dish was an easy choice because when I made it a couple of weeks ago, our local sweet corn had just come into season, local green beans were available, and the recipe involves corn nuts or quicos. I’ve loved corn nuts since forever, but I never think to add them to dishes. That might be because I’m too busy eating them by the handful. The corn was cut from the cobs, and the kernels and cleaned and trimmed green beans were just briefly cooked. The vegetables were added to a big bowl along with sliced green onions, cilantro leaves, lime juice, some hot sauce, olive oil, and salt and pepper. The mixture was tossed to combine, and then placed on plates. I didn’t have nasturtium leaves, so I used some arugula for garnish along with thin shards of parmesan and the quicos. For a simple salad, there’s a lot happening here among the flavors and textures. The lime juice brightens things up, and the parmesan brings a savory note while the crunchy quicos make it fun. I stored the leftover salad without any quicos in it so they wouldn’t absorb moisture. I wanted to add them just before eating for full crunch. Whenever I need some cooking inspiration, I feel like I could just open this book to any page. I can’t wait to put that into practice. Reprinted with permission from Tartine All Day: Modern Recipes for the Home Cook by Elisabeth Prueitt, copyright © 2017. Published by Lorena Jones Books/Ten Speed Press, an imprint of Penguin Random House LLC. This is another salad that we made when we first opened Tartine Manufactory (see also the Tomato, Shelling Beans, and Cucumber Salad). Our chef, Sam, made this wonderful combination of two kinds of corn—fresh from the cob, and a corn called quicos, or maiz gigante (which also goes by the commercial name of corn nuts). The quicos are dry, crunchy, and salty and are balanced by the lime in the dressing and the sweetness from the fresh corn. Adding green beans and topping it with Parmesan cheese makes it a more substantial dish that could serve as one part of a two-item dinner, paired with a summer soup (such as the Summer Greens Soup), or a simple roasted chicken (see Spatchcocked Roasted Chicken). If you can get them, nasturtium leaves add a very nice peppery flavor. In a skillet over medium-high heat, cook the corn just until heated through, about 2 minutes. Set aside. Prepare a bowl of ice water. Bring a saucepan of water to a boil. Add the beans and blanch until bright in color, about 1 minute. Using a slotted spoon, transfer the beans to the bowl of ice water and let cool, about 12 minutes. When cool, drain and pat dry. 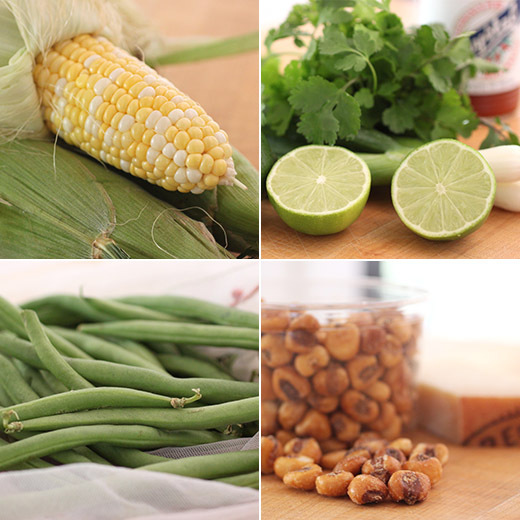 In a large mixing bowl, combine the cooked corn and green and/or yellow beans, scallions, cilantro, quicos, lime juice, hot sauce, olive oil, salt, and pepper. Taste and add more lime juice, hot sauce, salt, and pepper, if needed. Transfer to a serving dish and garnish with the nasturtiums. Grate the Parmesan over the whole dish and serve. Store in the refrigerator, covered, for up to 5 days. The quicos will lose some of their crunch after the first day. I love those corn nuts! A fantastic salad with awesome flavours, Lisa. Fresh and scrumptious. A fabulous dish! this looks great! i could eat green beans and corn at every meal, and i'm very intrigued by the addition of corn nuts, which i don't believe i've ever eaten at all. great recipe! Sounds like a great cookbook. And wow, what a wonderful dish! Tons of flavor and texture, plus it's really pretty. Thanks! this salad look absolutely delicious Lisa ! When yo can open a book to any page, well, that's the sign of a great cookbook. Must check this out. And this salad sounds awesome!